Air quality is considered satisfactory, and air pollution poses little or no risk. Air quality is acceptable; however, for some pollutants there may be a moderate health concern for a very small number of people who are unusually sensitive to air pollution. 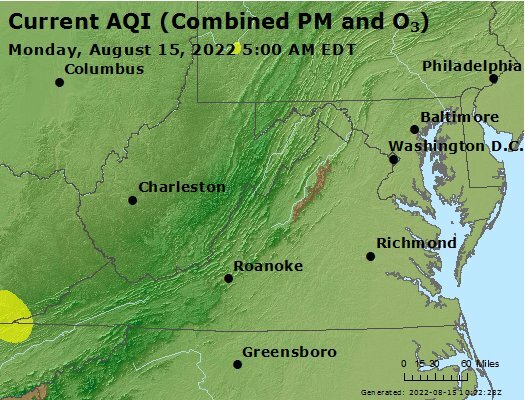 Although general public is not likely to be affected at this AQI range, people with lung disease, older adults and children are at a greater risk from exposure to ozone, whereas persons with heart and lung disease, older adults and children are at greater risk from the presence of particles in the air. Everyone may begin to experience health effects; members of sensitive groups may experience more serious health effects. Health alert: everyone may experience more serious health effects. Health warnings of emergency conditions. The entire population is more likely to be affected.